I'm the first to admit that my kids are very "plugged in" especially my 9yr old son. He is never very far from his DSi and ask him about Wizard 101 and he'll talk to you for hours. Throw Wii in there and yeah it adds up to a whole lot of screen time. The other morning though, Dyl was very quiet so I sneaked into the playroom to see what he was up too. This is what I found him doing. 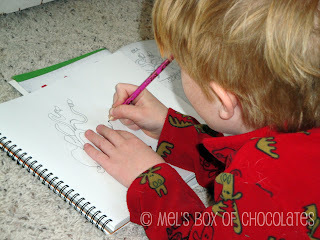 He loves to draw and he spent a good hour or so just tracing, free handing, and coloring in his pictures. I was quite impressed with his artistic skills. Now if only I could remember to get some pictures of his finished works! My 9 year old is a budding artist too! He just got a huge sketch pad and colored pencils for his birthday, and he's quickly burning through them. Isn't it fun to see them drawing what they imagine? Sounds a lot like my 9 yo Hanna. We stock up on the spiral tablets and I date them when she fills them up. Funny, she's a Wizards 101 fanatic too. I guess 9 is a good age for drawing! My 9 year old is the same way. 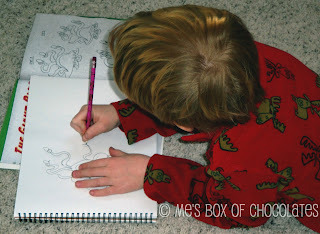 He loves to draw too! I am terrible at drawing, so it is a lot of fun to see him do so well with it. He looks so intent. What a great way to promote his creativity.